Wednesday, April 13, 2016, the United States saw its largest strike since 2011. 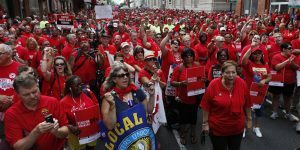 Out of anger of the company’s inability to present union leaders with a reasonable new contract, Verizon workers took to the streets to protest. 45,000 members of the Communications Workers of America are on strike after they say Verizon has been exercising their corporate power to outsource jobs and making workers work away from their homes for months. The workers reportedly have not had a contract since August, and claim Verizon has not produced anything worth negotiating. An associate for Verizon voiced his concerns stating: “The main thing thing is that it’s taking the good-paying jobs and taking them away form the American public”. Verizon has been sending jobs to such countries as Mexico, Philippines, and the Dominican Republic in the range of 5,000 workers. The concern comes not only that they have been able to come to the table with a negotiable deal, but they seemed uninterested in even doing so. They have hired more non-union contractors according to union leaders in an effort to get rid of the union entirely. 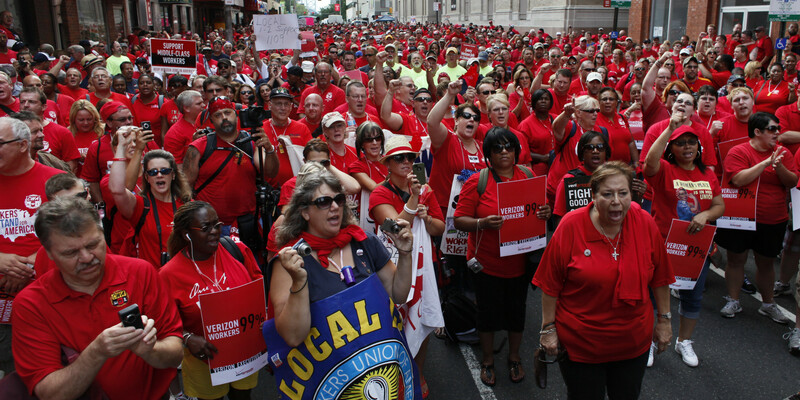 Verizon has seen large profits, which it says is not attributable to the CWA workers on strike. In fact, they claim their sector is in decline and the wireless sector of the business is why Verizon is posting such high profits. How long the workers plan to stay on strike is unknown, as well as if Verizon is going to attempt to come back to the negotiating table. The strike is not new as many companies have seen workers striking and getting angry at companies sending jobs to different countries. It has gained attention from presidential candidates, as the picture above was taken when Sanders showed up to rally with the workers. Verizon landline workers will continue to operate, as Verizon officials says it has thousands of non-union workers ready and trained to do the job while the union workers are on strike.